"Glenn Sontag is a highly qualified osteopath, whom I have no hesitation in recommending. I have benefited hugely from his expertise and thoroughly enjoyed the relaxing massages. I am not surprised that others are as keen as I am to take advantage of his friendly and totally reliable care." “Glenn has been treating my Labradoodle Bailey since October 2018. Initially helping out with an issue regarding his back legs giving way, Glenn’s osteopathy and rehab helped get Bailey standing and moving again. Bailey now enjoys fortnightly treatment from Glenn who varies his treatment depending on what is needed at the time. He has a great way of working with animals - in fact my other dog Madge always gives him a nudge to see if she can get some treatment too! 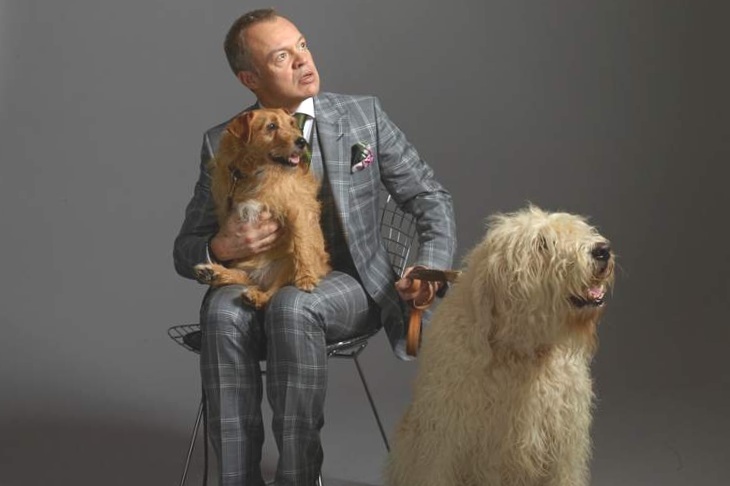 Graham Norton with Madge & Bailey. Copyright Dan Burn-Forti. "I have been treated by Glenn Sontag periodically for several years. During this time, he has increased his knowledge and range of treatments considerably and is now well-versed in many areas of alternative treatment - including osteopathy. He has a terrifically friendly manner, is an excellent therapist and really knows the human body. Not only knowledgeable, he clearly enjoys his work too. Unlike many practitioners, he always puts his patient's treatment first and the display of his own considerable knowledge second. I can't recommend him highly enough! He has magic fingers." "Osteopathy as a formal medicinal treatment is as close to a miracle as I have experienced. Recently, while appearing in a play at the Old Vic, Glenn was able to bring me from a point of excruciating pain and a certainty that I could not perform that day to being able to give a physically demanding performance on stage. I have a respect for Glenn and his area of expertise higher than I can articulate and I cannot recommend his services highly enough. Even those not crazy enough to be actors can benefit from his treatment and expertise."